The United Nations celebrates 2014 International Women’s Day under the theme of “Equality for women is progress for all’. Ensuring gender equality matters in many ways to the development process of a country. Gender equality matters in its own right and has been recognized as ‘smart economics’. Experiences from various countries confirm that gender equality enhances economic efficiency, and improves other development outcomes. 2012 data for Sri Lanka estimate that out of the total ‘economically active population’ (i.e. labour force) of the country, females account for only 33.4 per cent and out of the total economically inactive population, 70.3 per cent are women. This implies that there is a large untapped reservoir of womanpower that could be utilized for the development of the country, while empowering the individuals (i.e., females) and benefitting the entire society as a whole. On the other hand, attracting more women in to the labour force is of utmost importance, and of course a challenge, given the fact that the majority of the population in Sri Lanka is female. Fostering women entrepreneurs can be an effective way of capturing women’s potential in the development process of a country. Promoting and developing women entrepreneurship can benefit the economy in many ways. It enhances inclusive economic growth by generating employment opportunities and boosting the private sector at the local level; in addition, it improves the social, educational and health status of women and their families as women invest more in education, health and well-being of the family. On the other hand, women’s entrepreneurship is especially significant in the context of moving Sri Lanka towards becoming an upper middle-income economy, as female-operated Small and Medium Enterprises (SMEs) could well cater to the demands of the rising middle class. 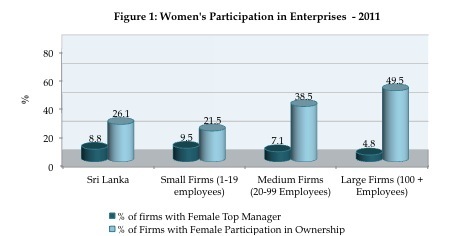 Though women entrepreneurs have been designated ‘the new engines for growth’ and ‘the rising stars’ of the economies in developing countries to bring prosperity and welfare, in Sri Lanka gender biases against women are common in the SME sector, a sector in which women should ideally be able to start up their careers as entrepreneurs. Regardless of the sizes of the business, fewer women are employed in top managerial positions and less number of women participates in ownership compared with men (Figure 1). Apart from the challenges faced by the SME sector as a whole (i.e., accessing adequate and timely financing, policy and regulatory issues, institutional weaknesses, limited access to larger markets in terms of market linkages, transport, telecommunications, and information and lack of innovation) lack of adequate financial literacy, negative norms and attitudes towards entrepreneurship as a career option, limited mobility, lack of access to networks and communication, an unequal share of family and household responsibilities, and no maternity protection further hinder the visibility of women in the SME sector. Easing these obstacles is of utmost important considering the high contribution by the SME sector to the country’s economy (SME sector accounts for 80-90 per cent of the total number of enterprises of the country, it employs 26 per cent of the labour force and have a value addition of 17 per cent) and the potential the sector has in increasing gender equality through employment generation for women. Improving Quality of Jobs in Sri Lanka: Can Exports be the Panacea? Anyone interested in entrepreneurship should get: Personal Brand Planning for life, available on Amazon to determine their unique skill set and persona so that they can market their entrepreneurial idea(s) more effectively. This western concept of empowerment and equality is completely against human need and a stable society. More importantly this retoric has been successfully used to enslave people by an economic system that is immoral that sacrifices the society and future generations as exemplified by the research of Elizabeth Warren Harvard Professor of Law.. She compared two families in 1970 and 2005 of the same standard of living. In 1970 only one person in the family worked and 16% of the income was saved ,2005 both husband and wife have to work but there is no savings. A 16 year old had a better chance of the mother being at home than a 6mth old baby in 2005. That is not to say that women should not work but the interests of the future generations and society must come first. The interesting question is if 2 people have to work today as against 1970 who is running away with the money earned by the other. Today money dictates but the real story of our children and society is hidden especially by the middle classes who get a half baked western education. Reality must pervade.